Cullen James is a young woman whose life dictates her dreams-and whose dreams control her life. In her first dream, she found the perfect man-and the same thing promptly happened in life. Now, she has begun to dream dreams set in Rondua, a fantasy world of high adventure, full of tests of her courage and strength. Slowly and quietly, her dream world is spilling over into her New York City reality and beginning to threaten everything she loves in life. Her friends are gathered to help her-but even her newfound courage may not be enough. I had never heard of Bones of the Moon until a copy arrived on my doorstep--an early birthday gift from my Polish pen pal, Patie. The premise sounded intriguing, but I opened the first page with no real idea of what to expect. However, I swiftly read it in just two sessions. From the very first chapter I was hooked. Carroll has crafted some amazing characters, and absolutely nailed Cullen. (Not all male authors get women characters right, but Carroll was spot on.) I was completely invested in her story from start to finish, and it was fascinating to see how things unfurled as the dream world and real life began to overlap. Though essentially fantasy, there's also an element of thought-provoking literary fiction to this work, and I thought that balance of magic and psychology was perfectly handled. My absolute favourite character was Eliot. I wanted to know him myself and have him as my best friend. 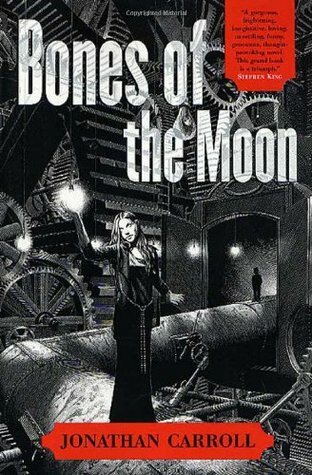 Bones of the Moon was an enchanting and contemplative read, and it's one I intend to keep on my shelf, as I think it's a story I'd like to reread in the future. Highly recommended for anyone seeking a quick but deep fantasy tale.